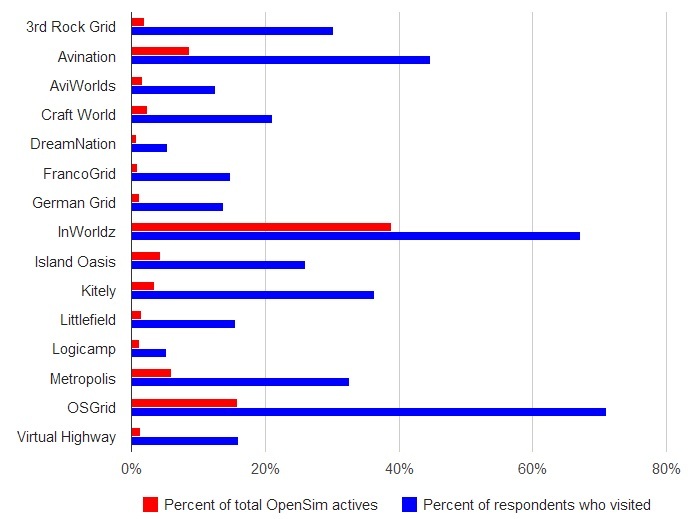 The results of the 2013 Hypergrid Business OpenSim Grid Survey are in, with 654 votes cast. Just over 90 percent said they would recommend the grid to others, a slight increase from last year’s 87 percent, 8 percent said “maybe” and less than 2 percent said they would not recommend their grid. 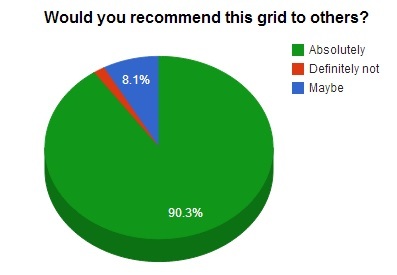 Percent of respondents who would recommend their grid to others. This was up slightly from 87.4 percent who said they would “absolutely” recommend their grid to others in 2012, 87.7 percent in 2011, and 89.5 percent in 2010. However, while this is a great statistic for OpenSim from a marketing perspective, it’s only to be expected. If people didn’t like the grid they were on, they wouldn’t stay there, and wouldn’t take this survey listing it as their primary grid. Kitely came out on top for “How do you rate this grid overall?” with a 4.93 score and 84 votes cast. It ranked second in technology, and, surprisingly, third in community. Kitely is not known as a community-oriented grid. Kitely was followed by AviWorlds, Zandramas, Littlefield, InWorldz, Metropolis, Avination, OSgrid, Virtual Highway, Island Oasis, DreamNation, and, last, by 3rd Rock Grid. The rankings for AviWorldz and Zandramas, however, had the greatest margin of error since those grids had 16 and 10 responses, respectively. There were other grids selected as primary grids in our survey, but they had less than 10 responses each, and so we’re not including their results. Those grids are 3rd Life, AnSky Grid, A Virtual World, Brasil Tropical, Craft World, Dorenas World, EdMondo, FrancoGrid, German Grid, Logicamp, Lost Paradise, Mintaka, Nara’s Nook, SimValley, the closed SirinHGpole grid, Tangle Grid, UFSGrid, Valhalla Virtual, and Virtual Gay Kingdom. The startup social grid Zandramas ranked best for community but — with only 10 responses — this rating is also the least definitive. Littlefield was in second place, followed by Kitely, Virtual Highway, AviWorlds, 3rd Rock Grid, Island Oasis, InWorldz, Dreamnation, Avination, and OSgrid. OSgrid is a large non-profit grid with a strong focus on testing. It also had a change in management last year and some communication issues which helped contribute to bad feelings among grid residents. Avination’s low community score is a surprise however, since this is a commercial, social grid with paid staff in place to help build in-world community. AviWorlds came out on top for content, followed by Littlefield, Zandramas, InWorldz, Island Oasis, Virtual Highway, Kitely, 3rd Rock Grid, Avination, Metropolis, OSgrid, and Dreamnation. AviWorlds and Zandramas, again, had the fewest votes, so their leading positions may not necessarily be representative. Littlefield is well-known for its community of content creators and its unique freebie shops attract visitors from all over the hypergrid. InWorldz, as the busiest social commercial grid, also has OpenSim’s largest community of in-world merchants. Many merchants looking for a second location outside Second Life turn to InWorldz because of that grid’s content protection policies, and the fact that it has similar export restrictions as Second Life. Dreamnation, as a brand new grid, should not be expected to have a great deal of content in place. OSgrid, which scored just a hundredth of a point above Dreamnation, is a non-profit grid focused on testing and development and does not actively promote in-world shopping and commerce. AviWorlds led in the support category, followed by Littlefield, Island Oasis, 3rd Rock Grid, Virtual Highway, Dreamnation, InWorldz, Zandramas, Metropolis, Kitely, Avination, and OSgrid. Smaller grids typically have an advantage when it comes to support because, with fewer residents, there are fewer issues to resolve. In addition, commercial grids have an advantage in that they have paid support staff whose job it is to deal with problems and complaints. Non-profit grids such as OSgrid are run by volunteers, and support is typically obtained from other users, via forums, discussion lists, and in-world meetings. Again, Avination’s low showing is a surprise. AviWorlds led in the technology category, followed by Kitely, Littlefield, Zandramas, Virtual Highway, InWorldz, Metropolis, Island Oasis, Dreamnation, 3rd Rock Grid, Avination, and OSgrid. I’m not sure why AviWorlds ranked the highest here, other than perhaps its small but passionate group of respondents voted it high in every category. Or perhaps it’s a reflection that it made the right choice in picking Zetamex as its hosting company. While many of the older, established grids, such as InWorldz and Avination run their own servers and regions, new grids are increasing turning to hosting companies like Zetamex and Dreamland Metaverse to handle the technology, while the grid owners focus on marketing, community building, and content. Kitely earned its high technology ranking the hard way, with a succession of technological improvements this year. The grid currently offers regions capable of holding up to 100,000 prims, and 100 avatars, via a unique cloud-based, on-demand system. 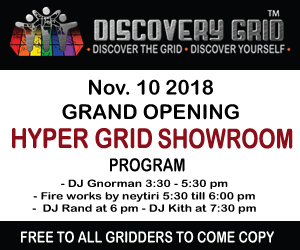 In addition, the grid recently launched its Kitely Market, the best web-based marketplace currently available for OpenSim grids, and plans to expand this marketplace to the hypergrid. This weekend, the grid also announced an upgrade to the latest version of OpenSim, 0.7.6, along with a list of bug fixes that they are donating back to the community. Few other grids are as consistent and proactive in donating code fixes. OSgrid typically runs the latest, cutting-edge version of OpenSim, which may occasionally result in some bugs or instability. It is also the largest grid by land area, which puts stress on volunteer-run servers and systems. In addition, many regions are self-hosted — running on personal computers that may have slow processors, low bandwidth, or may be off most of the time. We added up all the grids that folks either picked as primary grids, or that they said they had visited, and for the most part, the number of responses coming in was roughly in line with the reported monthly activity on the grid. OSgrid was the grid that most users had visited, with 71 percent of respondents having been on that grid. What percent of respondents visited each grid. InWorldz was a close second with 67 percent, followed by Avination at 45 percent, Kitely at 36 percent, and Metropolis at 33 percent. 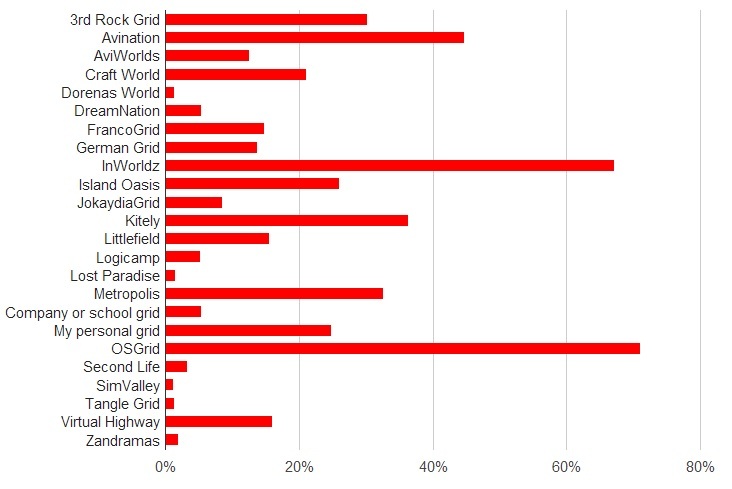 3rd Rock Grid was visited by 30 percent of respondents, Island Oasis by 26 percent, and 25 percent of respondents had visited their own personal grid — even though only about 1 percent of respondents considered it to be their primary grid. After that, in decreasing order, came Craft, Virtual Highway, Littlefield, FrancoGrid, GermanGrid, AviWorlds, JokaydiaGrid, DreamNation, a company or school grid, Logicamp, Zandramas, Lost Paradise, Dorenas World, Tangle Grid, and SimValley. The last five had been visited by between 1 and 2 percent of respondents. How many active users the grids reported last month, versus share of survey respondents who said they had visited the grid at some point in the past. Comparing visit numbers to active user numbers, InWorldz seems to be able to convert its visitors to active users better than any other grid. It was visited by about two thirds of all respondents, and accounts for almost 40 percent of all active OpenSim users. OSgrid was significantly less sticky, as were most other grids. All the statistics here are straight averages. Grids with less than 10 respondents were not included in the totals. For folks worried about the grid stats being rigged, I have deleted some instances where people voted more than once. The majority of these cases looked accidental, as if the form had been submitted twice by mistake. There were also a couple of cases where the emails were invalid or fake. Grids that had a large number of submissions also had a wide variety of responses and comments — I didn’t see any evidence of ballot stuffing, with large groups of people giving top marks across the board for any particular grid. There were a few exceptions. Non-English grids had fewer respondents than their traffic numbers would have predicted, possibly due to the language barrier, and the fact that they’re less likely to be readers of Hypergrid Business. This might not be the whole reason, however, since the French-language FrancoGrid, the German-language German Grid, and Craft were all well represented last year, but not this year. Since these three grids did show up in the visited statistics this year, however, it could simply be that the users of those grids actually consider another grid their primary home. Avination was also underrepresented in the survey this year, with only 11 responses, compared to 34 responses last year. As can be seen from the “visited” numbers, many of our readers have been to this grid but have decided, for one reason or another, not to make it their primary home. Kitely had 84 responses this year, up from just 24 responses last year, and many more than its active user numbers would have predicted, a possible sign that its users have been happy with the recent improvements. More than 200 respondents wrote in comments, some very detailed, about their experiences on the grid. Only one of this year’s 11 respondents who considers Avination home wrote a comment. It would take a book to print all the comments left by InWorldz residents. A couple of people complained about empty regions and support but, for the most part, respondents were overwhelmingly happy about community and many mentioned that they felt at home on this grid. Many respondents pointed out Kitely’s unique pricing model as a major benefit. Kitely runs its regions on demand, in the cloud, and stores them away when they are empty. As a result, the company is able to offer dramatically more land and prims for very low prices. Respondents also pointed to the Kitely Market, the coming hypergrid support, and the easy OAR region backups and uploads as attractive features. Littlefield is a mid-sized social grid that was originally best known for its alternative adult lifestyle community and content but has since grown into a well-rounded community group that serves diverse populations. It also happens to be an extremely well designed grid, with a strong core of content creators sharing their work with the hypergrid. Respondents lauded this French-language grid for its education focus and low prices. Metropolis is a Germany-based grid, hypergrid-enabled, that became a favorite destination last winter after OSgrid’s management change. This is a new niche grid, focusing on serving writers. Many respondents praised OSgrid’s openness and innovation, while some were concerned about content, technology, and community. “Zandramas is a ‘closed’ grid, people can on join on referral. Maybe this will change in the near future. But the fact that we are a ‘closed’ grid makes it not very interesting for copybotters and grievers to join. Which also has a positive effect on creators and the privacy of the community.